Daily Jasarat Karachi is an Urdu daily newspaper of Pakistan publishing from Karachi since 1970. 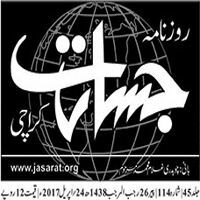 Jasart Karachi is the first online newspaper of Pakistan. It means jasarat is pioneer in the field of online urdu news. Syed Zakir Ali is the publisher and Athar Hashmi is Editor in chief of jasarat newspaper. Roznama Jasarat Karachi can be purchased by spending only 12 Pakistani rupees and it has 12 pages too having front page for breaking and important news from Karachi and other cities of Pakistan. Other pages include sports news, showbiz news, columns, editorials, classified ads, baqia, health and technology news. The back page is also filled with important news and stories..